As you might expect, most computer users perform the majority of functions in and around Windows using their mouse or laptop touch pad. Sometimes a keyboard shortcut has to be pressed where there is no obvious mouse driven alternative such as Alt+Tab to scroll through open programs, but some users don’t like using the keyboard unless it’s to type a letter. But if you think about it, using keyboard shortcuts could save time and effort compared to only using a mouse, and using both in combination can really help get things done more quickly. Many IT professionals and geeks can get away without using a mouse at all in Windows and applications quite often, but there are so many shortcuts available it’s hard for the average user to know what they are because there are so many available that a lot of us don’t even know exist. Some keyboard shortcuts are universally very well known by nearly every user, even if they choose not to us them. The problem is there are literally hundreds of different and also lesser known keyboard combinations in Windows alone and it would be completely impractical for you to sit down and try and learn them all in one go. You can either go to the official website for your product to hunt for the keyboard shortcuts, or you can just go to a website that has a database of keyboard shortcuts for your convenience. 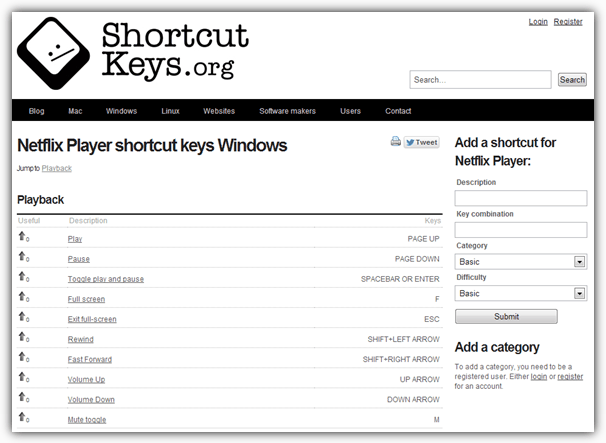 ShortcutKeys offers a small selection of keyboard shortcuts for Mac, Linux and some websites such as Twitter, Facebook and some Google products. The main section is obviously Windows with around 40 software products listed which isn’t huge but covers many common titles. If you’re looking for Windows 8 shortcuts, we rather strangely found them in the Websites and not Windows section, so it is worth a quick search or browse if you can’t find what you’re looking for. What we quite like about the shortcuts page for each product is the nicely laid out list and the way it is split into easy to read categories. For instance, iTunes has 5 categories of Basic, Playlist, Music Store, Window and Library so it’s easy to find the required shortcuts by browsing in the right category. You can easily add a missing shortcut yourself if needed, but this is sadly open to some abuse and we did find 1 or 2 entries which were obviously from people just playing around or seeing if it works. At least you have to create an account to add a category which also lets you vote for useful shortcuts. 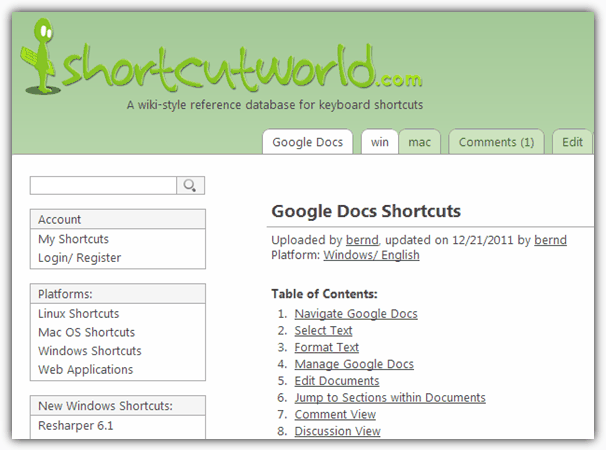 ShortcutWorld calls itself an open Wiki style reference database and relies heavily on user input to keep its database updated and add new titles. It supports a few Linux, Mac and Web based Applications such as Dropbox and a number of Google services, and obviously a larger selection of Windows based applications, currently standing at around 60 products. The layout of the shortcuts is very easy on the eye and like ShortcutKeys, lists everything in easy to read categories. ShortcutWorld goes a bit further though and also lists a table of contents, has collapsible categories, there is a comments tab to offer or read feedback and options to print or download the list as a PDF. Make sure to check for different versions of the products you’re looking for, such as when you click the Windows shortcuts link it will default to Windows 8 shortcuts, but XP, Vista and 7 are also available from a tab at the top. Creating an account will give you access to add new titles or edit current products. Unfortunately the ShortcutMania project seems to be pretty much abandoned with the last update appearing to be in 2011. Although the latest products from the likes of Microsoft and Adobe etc aren’t going to be here, all the titles currently listed are still fully viewable so the site still has a good deal of value to it. The lists of shortcuts can be searched for or browsed by name or vendor. The shortcuts are layout out in categories and are easy enough to read if a little small on the font size. A useful option is the choice to download or print the list in either HTML or PDF format, although the edit button next to them no longer works. 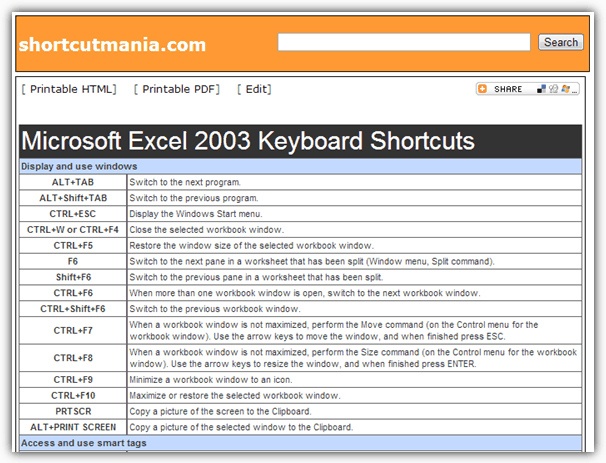 If you can find an up to date set of shortcuts here you want, ShortcutMania could still prove to be a useful resource. Of course, if you want a quick and easy list of keyboard shortcuts for common operations in Windows, an obvious place to look is the Microsoft website. 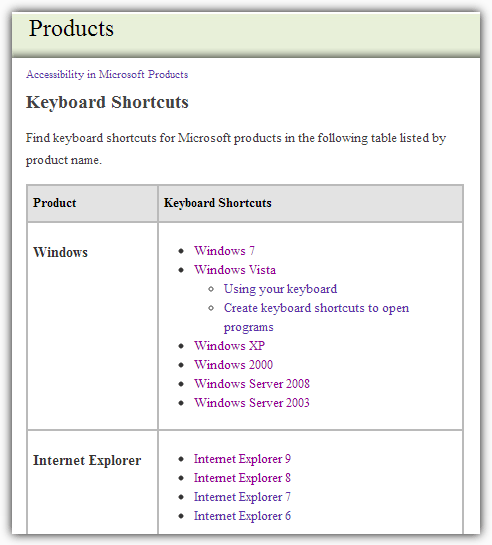 One page at Accessibility in Microsoft Products has a list of links to a number of product shortcuts including Windows, Office, Internet Explorer and Media Player. 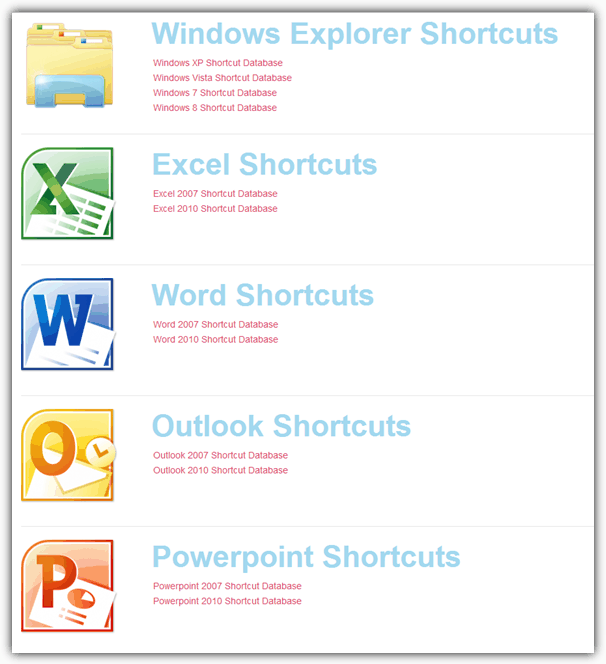 It doesn’t include Windows 8 shortcuts though, a full list for them can be found on the Windows 8 Shortcuts page. There is also another huge list of general keyboard shortcuts over at Wikipedia which includes Windows, Mac, Linux and even some Emacs shortcuts. Although the selection isn’t large it is still very useful and offers separate lists for Windows XP, Vista, 7 and 8, along with the 2007 and 2010 versions of Excel, Word, Outlook and PowerPoint. The shortcut lists are searchable and laid out in alphabetical order with a description of each and a nice little few paragraph intro. At the bottom is an option to download the list as a PDF file which is handy if you want to refer to it at a later time. Following on from the KeyRocket shortcut database, is the freeware desktop application of the same name that behaves like a virtual teacher and watches your mouse actions while in Windows. It then recommends keyboard shortcuts when it detects you are repeatedly using the mouse for an action and there is an equivalent shortcut available. The database consists of around 1600 shortcuts for Windows XP, Vista, 7 and 8 as well as the 2003 to 2013 versions of Excel, Word, PowerPoint and Outlook. 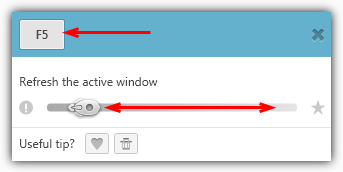 The program will simply sit in your tray and watch what you do with the mouse, and if you repeat actions that have a keyboard shortcut alternative, a popup will appear showing you what it is. 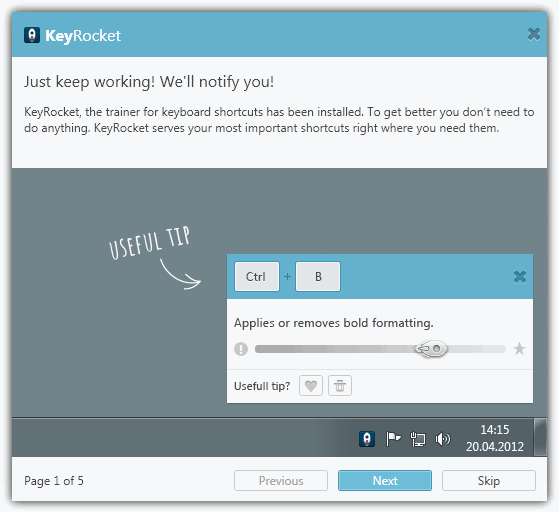 Now KeyRocket keeps track of how you subsequently perform the specified action and likes it if you use the keyboard, or dislikes it if you keep using the mouse, displayed with a sliding mouse on the popup window. 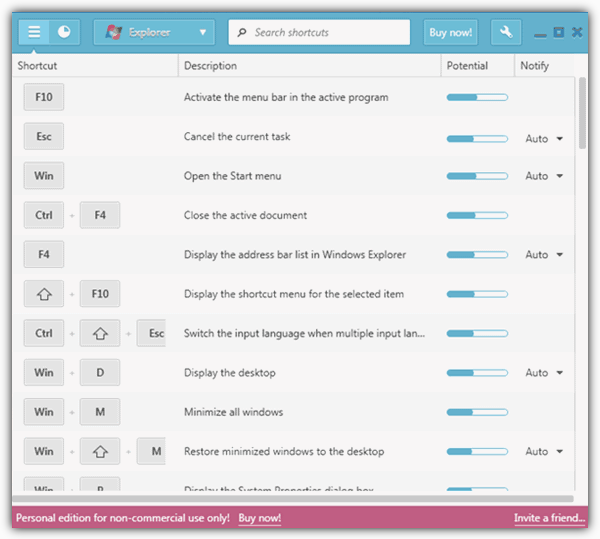 Although KeyRocket recognizes Windows shortcuts it doesn’t work from programs like Internet Explorer, Notepad or Paint etc, only the Desktop, Explorer and Office applications. KeyXL used to be the go to site if you wanted to know shortcuts for a specific program and had one of the largest online databases around. Sadly the site seems to be quite a way behind these days and doesn’t even have shortcuts listed for Windows 7, 8 or more recent versions of Office among many other applications that haven’t been added in well over a year. Also KeyXL seems to be suffering from server configuration issues and it appears to be pot luck if you get into the site or be presented with an Apache test page. Sometimes using a proxy or VPN can help if you really want to try and get in but can’t. We’re not sure if it’s a temporary problem or the site has quietly been abandoned. If you can get in, there are still huge amounts of shortcuts for older applications which might prove useful. D’ya have the flip side to this pgm? I’d love one that would let me toss away the keyboard except when I actually have to type something-like say this note..
Neat app. As an IT people, even I don’t know the entire shortcut for Microsoft office. This will help a lot. Tqvm. correction keyrocket. Thanks for this tip hal9000. I will use it when i buy a new keyboard. My keyboard is broken. @ paranoid: Thanks for that, not sure where the sky bit came from…. !